After reducing the original Garminfone pricing from $199.99 to $129.99 with a 2-year agreement, Magenta has decided to do yet another price cut on the handset, this time for existing customers only. Qualifying existing customers can now pick up a Garminfone for only $99.99 after rebate with a 2-year contract. Honestly, I think this is a more suitable price for the handset and will hopefully drive more sales. Anyone thinking about purchasing one, now that you can snag one for only under $100? ← BlackBerry Bold 9780 Has T-Mobile Launch Screen? T-MO. if your reading or if this can be a suggestion.. why not long term customers a more flexible upgrade program??? so, 6 month contract for $299 disc or 1 yr contract for a $199 disc. or a 2 yr contract for $129.00 disc. this will at least entice phone buyers who upgrade alot to have the flexibility of choosing a phone whether to just play with or for long term use. the selection of phones are just starting to get better for T-MO and the vibrant is my most recent upgrade. i paid full price!!! i upgrade everytime an awesome phone comes out. Windows phone 7 is my next phone but give me (or should i say us the customers) an option to upgrade at a certain price. your already selling all new phones at $199 with 2 yr contract. I would saw that t-mobile would lose massive amounts of money on customers who upgrade often with discounts, don’t you think? the upgrade program is the way it is for a reason and i promise you it is not to lose money. Air one, to answer your question, they would go bankrupt if they had such a program. Think about it. Another suggestion, why not offer a 5-6 yr contract for those who want to with unlimited upgrades… cancellations within 2 yrs is $500 or anytime after 2 yrs is $200. if i want the windows phone 7 htc, samsung, lg versions (if your going to have them all) let me have the option of buying them all at a decent price. your still getting the revenue. Now that’s just stupid. Unlimited upgrades with discounts? Look, if you can afford to buy all those phones, and i don’t understand the point of it, then you dont need discounts. Maybe your right, but who upgrades that often? i upgrade at least 2wice a year. i upgraded to the vibrant just because of the screen size bieng 4in. and the quality. once winmo 7 comes im getting on of those. The average customer will upgrade 1nce every 2 yrs. if they are ok with selling the garminefone for $199 with 2 yr contract and now $129 for current customer with an upgrade option. i know they didnt sell that many garminefones in less than 2 months. they are clearing out overstock? if they can offer this phone off the shelf at this price they can at least take care of there long term customers by giving them (me) an option to upgrade at a decent price. im not asking for a $129 price for a new phone but can i get a better price on an upgrade even tho my contract is up in 2yrs. why you think they make you sign a 2yr agreement, overtime it makes up for the cost of the discount of the phone. On the outset, this does sound like a losing situation but let’s consider this aspect – long term contract with phone refresh. Consider a 6 year contract, pick any phone you want, and only a fee is charged for an upgrade, basically covering the refurbishing costs. The contract and costs can be options in High End Smart Phone and non-smart-phone (for now). This is more like long term commitment but “leasing” a phone…then you end up with customers that get to stay on the technology curve or try many and different types of phones. The quicker the customer changes phones the faster a “refurbished” phone can be sold (still desirable). This already exists in the automobile world (rental/program cars) but with a long term commitment. Since I had the T-Mobile Wing I WANTED to upgrade to Touch2 Pro, then G1, then I did get the MT3G, then WANTED the MT3G Slide, then the Vibrant. I even WANT the new phones…yet only past 1 year in the contract so I will end up paying large sums of cash for maybe wanting something different yet still end up in a long term commitment. hmm i wonder why the price has been cut in half in less than 2 months???? oh come now Isn’t it obvious? They are selling too many of these things and want to attract even the cheapest of customers. They want to appeal to all. Haaa!!! Anyone actually have this phone? I mean its great if you love to travel or something of that nature.. but really? Any phone has GPS and this doesnt appeal to me in the slightest bit. I have never seen this phone outside of a T-mobile store… Hope the price cut helps to lessen the epic failure! Maybe the people that buy the phone are all out hiking and driving. I LOVE the GPS on it, i HATE the menu system/android skin. so i didnt buy it. I agree that the stock menu is not the best. I use the garminfone with adw launcher and the gala s theme to replace the home screen. It works very well for me. No wonder they cut the price, they couldn’t give that phone away. It will be stuck on 1.5 or 1.6 forever. Wow at the comments. Haaa!!! its too bad they can’t give existing customers this kind of deal all the time for all phones. I can’t imagine him upgrading twice a year!!??? Who has that kind of money just floating around? This phone is decent because of the GPS, it works offline, so you even if you are in a area with no service, your GPS will still function. That’s a pretty cool stand alone feature, as no other phone can do this. As for the UI, get open home or ADW or something else like those and your fine. This isn’t too bad of a phone, I didn’t get it, but I considered it as an exchange for my BH2. If I traveled a lot, I would have gotten this phone, but I don’t. The Nokia Nuron has GPS that works offline. Really? I wasn’t aware of that. You must have an internet access point defined in the device to retrieve assistance data from the Nokia A-GPS service over a packet data connection. The Nuron comes out of the box using an A-GPS reciever. Google A-GPS to see what the difference is between those receivers that depend on a dedicated satellite radio based GPS reciever and others based on smartphone cellular radio based GPS. If you’re a backwoods hiker or offshore fisherman, I wouldn’t rely on a Smartphone with only assisted GPS to give me my position if you’re outside cell tower coverage. My brother has this phone. It actually is a nice phone, except for some of the clunky menu setup but other than that it is not that bad. Like I said nice, except for some of the little hoops you have to jump through to access the phone. T-Mobile does offer a yearly upgrade for customer’s that have an $89.98 or higher voice plan (no addons included). I believe the only catch is that they must be data phones. T-Mobile DOES allow you to do this. I’m only 1 year into my 2 year contract and they are giving me full upgrade now if I want to use it. Sometimes the customer loyalty dept helps you out. Just repeat what you just said to them and they may help you out. I considered this phone, until I saw that it was Android 1.6. It probably never will get up graded. The GPS would be nice, but if you are in an area with data service, Google Navigate works almost as well. You don’t get some of the bells and whistles, yet (like Garmin’s nice display of upcoming restaurants, etc). For me, being stuck at 1.6 was a deal breaker. T-Mobile allows you to upgrade every year at the two year price with the contract extension as well. I have done it three times now since I have three lines on my plan. i think you are talking about the partial upgrades right? That is funny….my wife couldn’t get a full upgrade price and $400 for a MT3G Slide which is NOT worth that…so she suffers with the G1. AirOne- unfortunately, neither of those options would be financially feasible for the company. Also, FTC would never allow a 6 year contract. 2 is more than enough for the majority of customers. TMOProphet- The Nuron and E73 both have offline GPS Capabilities as well and more will follow from other manufacturers soon. Currator- VZW does have an early upgrade program; however, this is for select prime customers, and I believe you can only use 1 per year. So if you have a 5 line account, I don’t see it benefitting you too much. Thats just my opinion though. Totionist- You are correct on our early upgrades; however, it must be done through T-Mobile corporate (which unnfortunately is usually much higher priced than Wal-Mart, Radioshack, Best Buy in most cases.) This is also for specific accounts as well based on tenure, payment history, and credit class. Bob- You would be amazed at how many customers choose to buy several new phones a year! Word of the wise, if you have 2 lines on your account and are not on an unlimited plan, it may be beneficial to add that third line and pay the extra $5 per month to have that extra upgrade every two years! Heck, add three more and pay an extra $15 per month and now you have 5 upgrades every two years! Thats an average of 2.5 per year… Promblem solved AirOne without a $500 ETF or 6 year contract! Sounds like ripping off tmobile. the device off contract is worth at least 200 maybe 250 seeing as its a offline gps. There’s no way to upgrade as the no contract price is crazy. Ok people. For those who don’t know how T-Mobile’s new policy works. If you have a rate plan of 89.99 or higher (base), you get your full upgrade on all lines every 12 months. Does it apply to EM+ family plans? When you go to even more plus, There is no subsidy, meaning no discounts at all. the garmin phone is one of the least stable android phones ive put my hands on. Its sad really. With a decent ROM it could be a nice mid/low range android phone. Built in pinch 2 zoom, the 3mpx camera actually takes decent pics, and the screen is nice and wide. If it wasnt so unstable and had such a silly skinning job (really, u cant run widgets on the damn thing.. why?!) it would have been easy to reccomend it to anyone wanting a decent but not expencive android phone..
All things concidered, there is no reason to buy this phone.. lol. i dont want people comming back and yelling at me because it doesnt work. Most of the store demos i know of have gotten stuck on a boot up load loop and needed to factory reset more than once..
get the slide, vibrant or a cliq/xt. You had such promise but alas it never came to be. They’re dropping the price because of the dismal sales for this phone. In 6 months they won’t be able to give this phone away free on a 2-year contract because a whole slew of better phones will be competing for our money. I got this email too. I clicked the link & clicked the next one. When it took me to the phone into the upgrade section I see 389.99. They fooled me. Its not to all tho. I played with this phone for the first time in a t-mobile store today and I was blown away by how terrible it is. It’s an ok looking phone, but that skin they have running on it is just abysmal. IT’s downright ugly and it’s barely even Android at all. That, and since all Android handsets 1.6 and up have Google Navigation that runs really well, there’s no reason to buy this phone. You’re better off with phones that are older and free. Nothin else needed to say. Case closed. I’d buy it for $99 outright. I’m not sure why really but I would. even if this were free, i would not get it. If it was free I’d get it for a backup phone. to those who complain about existing customer prices: you are signing a contract, live up to your part, and t-mo will live up to their part. and 9 out of 10 times if you don’t act like an a-hole you can/and will get a killer deal! …and this price is only for existing customers…upgrades get better pricing than new customers. Offline gps is the best part. If garmin upgraded to 2.2 and gave option to turn off the skin, sales would pickup. I’m looking a magical device to replace my bb 8900, my zune 80 gig, my Ipod touch 32gig, and car gps. If they made it in the form factor of the 3790T, with 2.2, I think it would sell a whole lot better. I have a vision of thousands of Garminfones winding up buried in a landfill. Garmin is in real trouble. I bought the Garminfone on father’s day for free, just paid the sales tax. I have had no isues with it. Navigation is very good and everything that a I expect from a smartphone is there and works fine. Android 1.6 is not a dealbreaker for me, also if you want to run a regular android UI just install ADW launcher and you are set. FYI I also own a Nexus One running 2.2 and I have had more stability and unresponsive screen issues with it than the Garminfone. Wiil probably sell the Nexus as I find myself using the Garminfone more and more. I have owned this phone for about two months now and i have loved it. No problems to speak of and why spend the money on two different peices of equipment when i can have it all in one. Throw in the mp3 play and the ability to stream pandora through the phone to my car wirelessly is or through my usb jack is amazing. my next phone will hopefully be the next generation of this one if it comes out… ADW launcer works great. Only issue is it is kind of slow when undocked from the mount. Most likely due to the rediculous amoutn of applicatino i have on the phone. Thanks Android. 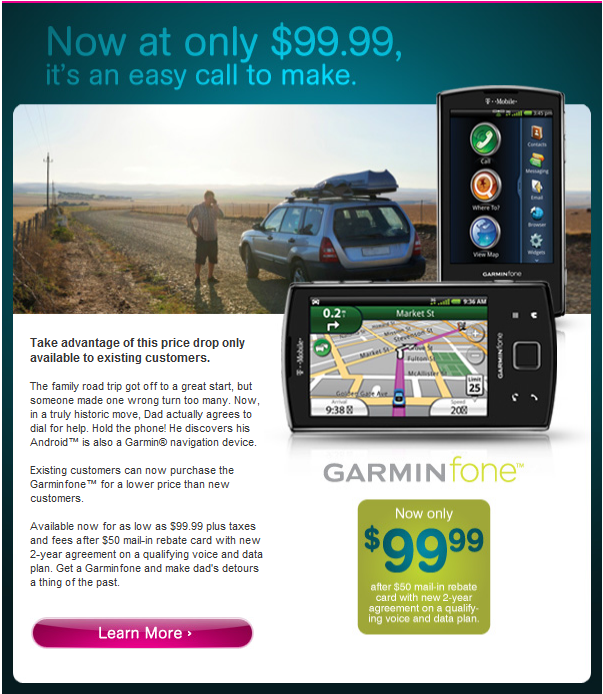 Interesting enough the Garminfone is still $129.00 after a $50 mail-in-rebate. My girlfriend had this phone…twice…and she was like she’s sick of it so she’s gonna go to VZW and get a Droid or whatever. I told her she should’ve gotten my phone(MTS) but she didn’t listen. So I’ll let her go there and go broke…lol nah I’m just kidding bout the go broke part! actually, i like it so far. have had it for about a month and it does what i expected. true, it could stand to run current versions of android but 1.6 does the job. it plays music, does the nav thing decently, form factor and performance aren’t clunky but ould be smoother. my only real gripe with it at this point, is i can’t set the display to permenantly remain in landscape mode.